The story begins with some interesting parallels. First, Rebekah is barren, like Sarah—Here, “barrenness” is not really infertility, but childlessness. But, once again, the promise of God is in danger. And second, like Abraham, Isaac is old when he becomes a father. The difference, though, is that both Isaac and Rebekah demonstrate the importance of God in their lives. They both pray. God answers the prayers by enabling conception, but the reason for the painful pregnancy (twins) can be interpreted as a sign of the future relationship between the descendents. When the twins are born, there is a uterine struggle to be born first, a struggle that Esau wins, (making him the “firstborn” and in line for the birthright). The birthright implies a leadership position in the family and establishes a claim regarding inheritance. Once again, God’s mission is forward by things NOT going the way that they should have gone according to expectations and tradition. This story is almost cartoon-like on some level. But somehow the story survived through centuries upon centuries of oral tradition. It is the story of the beginnings of a family rivalry that eventually escalated into a hatred between two nations—the Israelites and the Edomites. Esau is almost depicted as a caricature of reality, a cave man of sorts. But, keep in mind, that history is always written by the winners. And yet, things can be dysfunctional and awful and ridiculous and God can still move through and in its midst. God can still accomplish what God has set out to accomplish. Once again, God does not just choose the A-list winners to make things happen. God chooses ordinary people to do extraordinary things and live to write the story. And even in our struggles–even when we do stupid things like giving up our birthright or tricking someone out of theirs, God is always present working toward the reconciliation of all of Creation. (Although I have visions of God daily having cause to look at someone, including me, and ask, “Really?”…”Are you kidding me?”) (And looking ahead, Esau is not tossed out of the Middle East. He prospers and is able to provide for his clan. Then in Genesis 33, the brothers reconcile and together they bury their father.) The point is not that God gets what God wants. After all, why would God have WANTED Jacob to trick Esau into giving up leadership in the family? It’s just what happened. Families do strange things sometimes. Sometimes, in fact, we’re pretty awful to each other. I’m not sure if that is God’s plan at all. Maybe grace just always makes it all work out. Maybe THAT’S the birthright that we’re supposed to claim. All of these Abrahamic family stories that we are reading in this Lectionary year are probably difficult for us because we do not understand the word “blessing”. Blessing is not about receiving good things or being showered with lots of stuff or being spared from some random catastrophe (while your next door neighbor’s house gets the roof blown off!). Blessing is not about what we receive; blessing is about becoming who we’re supposed to be. Blessing is about God’s grace. So, which of the twins acted the most reprehensibly? As with most historical accounts, it is the victor that gets the chance to write history. This is no different. How would the story different if it were told from Esau’s perspective? So what does this passage say to you about God and God’s grace? In verse 5, Paul lays out the two ways of living—two mindsets—of the “flesh” and of the “Spirit”. For Paul, of the “flesh” is not as humans but rather a perversion of who we should be as humans. But it is the “way of the Spirit” that brings life. And since, as followers of Christ, the Spirit of Christ dwells in us, we do have life. If we live in the “way of the Spirit”, the essence of God will be breathed into us and bring us to life. That is the way to true freedom. Here, for Paul, living within the “law”, living within the Spirit, is living within the power of love. We tend to get wrapped up in those things of the “flesh”—our needs, our desires, our fears. Paul is not saying that we dispense with them as bad. Paul is making the claim that God’s Spirit, rather than the law, can breathe new life into them. There is no sense in fighting to sustain our identity apart and away from God. It will ultimately die. Paul has more of a “big picture” understanding than we usually let him have. He’s saying that the flesh in and of itself is not bad but the Spirit brings it to life. I don’t think he is drawing a dividing line between darkness and light, between mind and Spirit, between death and life; rather, he is claiming that God’s Spirit has the capability of crossing that line, of bringing the two together, infused by the breath of God. It is a spirituality that we need, one that embraces all of life. It is one that embraces the Spirit of Life that is incarnate in this world, even this world. I mean, really, what good would the notion of a disembodied Spirit really do us? Isn’t the whole point that life is breathed into the ordinary, even the mundane, so that it becomes holy and sacred, so that it becomes life? Once again, there is no place that God is not. God’s Spirit moves in the midst of all of life, in everything that is “us”. Maybe becoming aware of that is what brings blessing into our life. Maybe it is that grace that brings us closer to God. Episcopal priest Robert Capon calls this parable the “touchstone” of all the other parables. It is found in all three synoptic Gospels as well as the non-canonical Gospel According to Thomas. To set the stage, this parable was probably told at a time well into Jesus’ ministry. The disciples and the other followers had come on board excited and rejuvenated by their new-found faith and their wonderful, loving leader. They joyfully spread his message of hope to those around them. But things just weren’t turning out the way that they had originally envisioned. The response had been meager at best and they felt like they were hitting brick wall after brick wall. They were tired and some had actually considered quitting altogether. Jesus probably realized the seriousness of this situation. Because you know how it works. Once despair and disappointment begins creeping into a society, it is contagious. So Jesus got up and went outside the house in an effort to address the largest crowd that he could. He even got in a boat and paddled just far enough out into the water so that the entire crowd could stand around the shoreline and see him. And then he told them a story. Now this was not the first time that this crowd had heard a story about seeds. The sowing of seed was a fairly common image in the Bible and in Jewish literature. It generally referred to God’s interaction with the world. And here the sowing of the seed becomes a metaphor for the Word, which is wonderfully and extravagantly showered upon the world. But this image of the seed being precariously thrown about is probably bothersome to us. After all, what a waste! But this story is MEANT to shake us up a bit. Perhaps the sowing of God’s reign SHOULD be done without reservation because isn’t that, after all, what God has offered us? So perhaps there is not some specific pre-determined way to sow the seeds of the Kingdom. Perhaps seeds and their harvest come in all shapes and sizes. It also makes us realize that there are many factors that affect the harvest. Some seeds will be immediately snatched away as they fall on ears that refuse to even hear them. Others will be sown on rocky ground, sprouting with a burst of jubilant enthusiasm and then becoming disheartened and discouraged with faith when life does not turn out the way that they would like. Then there are the seeds that sprout through the thorns, only to be choked out by the cares and pleasures of this earthly life. To put this one in a modern context, the cares, riches, and pleasures of life may be jobs, professional advancement, houses, luxury vacations, financial investments, expensive leisure, and perhaps even our religions themselves—those things in our life that get in the way of our relationship with God and spoil the harvest that could be. The three reasons for failure are not necessarily meant to be the point of this parable though. They are simply illustrations of the frustrations one must face in order to reap a harvest. It is true that there will be failures. Some years everything will wither away in drought. The Spiritual Life is not about success. Being an instrument of God’s grace does not guarantee easily-attained rewards. It doesn’t even promise that we will see the results in this lifetime. Most of the parables that we read in Scripture have been given sort of arbitrary title that is not Scriptural or even canonical. They’re just named because that was the title that was in our childhood Bibles above the story. But this one Jesus actually names. In verse 18, Jesus, says, “Hear the parable of the sower.” I think I always read this assuming that Jesus was the sower throwing out the seeds of faith and discipleship. But Jesus doesn’t say, “Hear the parable of my work” or “Hear the parable of my life”. God is the sower. God has sown the seed, the Incarnate Word, the Logos, Jesus Christ, into the very depth of Creation. With totally reckless abandon and unimaginable grace, God has sown the seed absolutely everywhere—in all conditions of life. 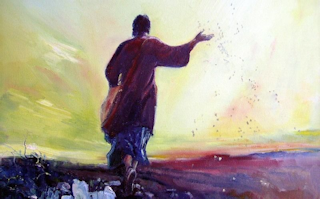 The Word made Flesh, as the writer of the Gospel According to John says it, has been sown into good soil and bad, among rocks and thorns, and it is present in every breeze that we feel. The entire Creation has been sown. It has already been done without any participation on our part at all. The truth is that it’s not about us. It’s not about our making ourselves “good soil”. The four types of soil do not depict four types of hearers; rather, they depict the human condition. Sometimes life includes pain and grief. Sometimes we have to endure rocks and feel like we are not rooted. Sometimes we live in such a way that we do have things that choke out our joy and our peace, things that cloud our image of who God is and what we are called to be. And sometimes in the midst of a long and deep drought, we effectively wither and die. If you read this parable in its context, “bearing fruit” does not mean getting everyone on your side or getting everyone to agree with you. This is not a call to converting the world. “Bearing fruit” means living out the Kingdom of God. It means following the way of Christ, who is present in all aspects of life. “Bearing fruit” means realizing that it’s not about us or the way we think it should be. God has already sown seeds in each and every one of us. “Bearing fruit” simply means letting them grow into what God envisions them to be. The truth is that I don’t think this is a story about our faith. I think it is the story of God’s faith in us. It is the story of grace—undeserved, unfettered, unending grace. It is everywhere that we can imagine and everywhere that we cannot, thrown throughout Creation with reckless abandon and extravagant generosity. Let anyone with ears listen! Anyone! (Not just the “good soil” people as we see them, but ANYONE!) It is this grace that has conquered sin and death and all the perils of life that we may encounter. It is this grace that has made us all drought-resistant. We will all wither and die and then when the seasons change, we will bloom forever. What changes about this parable when you look at the soil types as facets of the human condition rather than as separate types of people or separate types of hearers? What image of God does this hold for you? So what does it mean for you to “bear fruit”? In the name of the God who sends us to go forth from this place to blossom and bear fruit. Amen. Katherine Hawker, 1999, Evangelical UCC, available at http://liturgyoutside.net/APr10.html, accessed 6 July 2011.